Routes: Canada and New England, Mexico, Hawaii, and the Panama Canal. MS Veendam also offers a 35-day transatlantic itinerary and seven-day Bermuda cruises. Culture-focused cruisers who want a relaxing — not raging — cruise. Passengers who like beer-soaked nightlife. The line brings the local culture onboard with port-inspired activities and menus. The Pinnacle Grill serves marbled steaks sourced from a ranch in Washington state near corporate headquarters. The new Dive-In at the Terrace Grill offers mouthwatering burgers poolside. The ship’s stunning art collection is so impressive, you’ll actually want to spend time viewing the pieces. The18-year old MS Veendam is one of Holland America Line’s oldest and most venerable ships, and as such, it sticks with tradition, offering a grown-up experience. Formal nights are a must here, as is afternoon tea. But for all its elegance, the ship never feels stuffy — or extravagant, for that matter. Though the dated décor may show signs of its age, MS Veendam has plenty of contemporary spaces, thanks to consistent refreshments. It’s been refitted with some of Holland America’s current signatures, such as the Pinnacle Grill, Explorations Café, and Mix Bar — and, most recently, the Dive-In burger and hot dog grill. 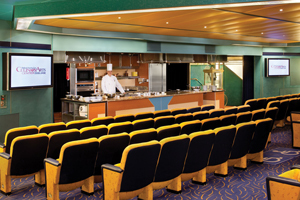 Though some of MS Veendam’s public venues appear a little worn, the cabins have a peppy, contemporary look. Standard amenities include some nice touches, such as fresh fruit and shoeshine service. Bathrooms have dispensers of Elemis® products — rare in standard staterooms — and a nonslip rubber tub mat. MS Veendam offers seven cabin categories, ranging from interior staterooms to the lavish Pinnacle Suite. 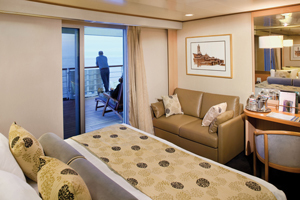 The Lanai Staterooms open up to a wraparound promenade deck (also a walking track) with lounge chairs; they offer more outdoor space than Vista Suites, which are less numerous on this ship than on newer vessels. Verandah Spa cabins have proximity — but not access — to the spa facilities, unlike their counterparts on Norwegian Cruise Line, Carnival Cruise Lines, and Celebrity Cruises. The spa cabins here also feature some wellness-oriented amenities: yoga mats, pedometers, iPod® docking stations, and discounted spa packages. The Neptune Suites (and sole Pinnacle Suite) are in a class of their own. The privileged passengers of these rooms get concierge service, complimentary laundry and pressing, and priority at embarkation and disembarkation. They also receive a bottle of sparkling wine, pre-dinner canapés, in-suite afternoon tea service, and corsages and boutonnieres on the first formal night. 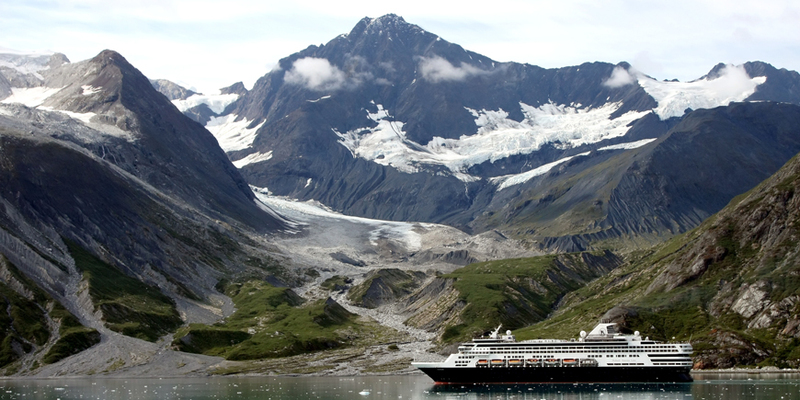 Holland America caters to an international set, a fact that’s apparent in its cuisine. You can take a tour around the world starting at the crack of dawn: Choose from a Dutch breakfast (an open-faced sandwich with ham, Gouda, and sunny-side up eggs), Japanese (miso soup, steamed white rice, tamagoyaki, broiled salmon), or a Scandinavian version (smoked salmon, pickled herring, hard-boiled egg, dark rye bread), along with more traditional American offerings, such as eggs, pancakes, waffles, and French toast. The line employs a Culinary Council to oversee the ship’s cuisine. The dinner menu at the main dining room, Rotterdam, features a daily special created by one of the consulting chefs — Rudi Sodamin, Mark Best, and David Burke, for example — which often turns out to be the meal’s highlight. Dishes such as striped bass with garlic mussels and potato soup with lobster and chili oil are sure to impress, while other courses hold their own. The Dive-In at the Terrace Grill is a recent addition to MS Veendam, and to the fleet. This poolside counter serves dressed-up Nathan’s® hot dogs and juicy burgers. I couldn’t get enough of the patties topped with applewood-smoked bacon, caramelized onions, and Gouda cheese on brioche buns. The hot dogs were equally finger-licking good and topped with melted cheese, pickled jalapenos, and red onions. Hands down, everything served at Dive-In is tastier than a reheated pepperoni pizza at the Slice pizza parlor. MS Veendam has two specialty restaurants. The Pinnacle Grill ($29) is the line’s signature steakhouse, which serves the best dishes onboard. The steaks, from a marbled porterhouse to bone-in rib-eye, are sourced from a ranch located in Washington state near the cruise line’s headquarters; the wine selection also focuses on Pacific Northwest vineyards. 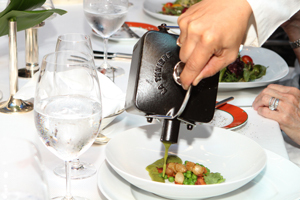 One night per sailing, Pinnacle Grill transforms into Le Cirque ($49), an elegant evening modeled after the legendary New York City restaurant. It isn’t exactly like dining at the venerable Manhattan outpost, but the menu feels special nonetheless. My almost impeccable meal consisted of a poached lobster with haricots verts and citrus, butternut squash soup with huckleberries, and succulent rack of lamb. On the other end of the spectrum, the meals at Canaletto pale in comparison to other Italian eateries at sea. The service was charming (our waiter humorously feigned an Italian accent when announcing the daily specials), but the kitchen delivered sausage with the texture of a hot dog, and polenta that was clumpy and cold. MS Veendam offers a subdued pace compared to other midsize and large ships, but that doesn’t mean that you’ll be short of things to do. You’ll find soothing — not blasting — music in the evening: classical duos, '60s and '70s tunes, country and blues, and blissful silence at the main pool during the day. What Holland America does best is bring aboard local culture. On a typical sailing, what you see in port, you’ll also see on the ship. Case in point: On my Canada and New England cruise, the Culinary Arts Center held poutine and chowder-making demonstrations, bartenders shook up Montreal gin sours, and bagpipers performed in the Showroom at Sea while a mussel bake was held on the lido deck. There was even a hockey-themed night at the casino, complete with maple leaf flags and team jerseys. On sea days, one of the most popular spots is the New York Times Explorations Café, where guests can curl up with a book, check out an iPod tour of the ship’s art collection, work on crossword puzzles, or play board games. On the upper promenade deck, you can use your digital camera, then edit photos and videos at one of the Microsoft-run workshops. Pools — one of which has a retractable roof — aren’t mob scenes, so you’ll never have trouble snagging a chair. And although the Greenhouse Spa is small, it has some fantastic massage therapists and a decent gym. MS Veendam also has an outdoor movie screen and a basketball and tennis court on which you won’t have to jockey for space. The theater showcases two featured performers per cruise. The rotation of artists means that you never know what you’re going to get. Acts range from hits to equally dramatic misses. On my cruise, a funnier-than-you’d-think comic and juggling act brought down the house, and a talented vocalist performed an Elton John tribute that was “better than Elton John himself,” according to many passengers. MS Veendam also hosts an entertaining version of "Dancing With the Stars" that combines dance classes with healthy competition. Elemis is a registered trademark of Elemis Ltd. and its affiliates. Nathan's is a registered trademark of Nathan's Famous Systems Inc.
What do you like best about MS Veendam?